Why do you need '9 Essential Life Skills? The challenges that face us in modern life are numerous and complex. In order to address them successfully you need practical and useful strategies. You need a reference guide that is easy to understand and apply. 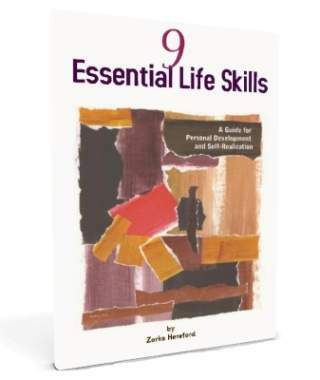 If you've enjoyed learning about the Essential Life Skills on this site you will love my guidebook/ manual 9 Essential Life Skills - A Guide for Personal Development and Self-Realization which goes into more detail and instruction. It is written in a concise, easy to read/understand format (soft-cover, or e-book) which makes it easy to reference. Life is ultimately a succession of learning and honing skills. The more skills you possess the more productive, successful and happy you will be. There is no doubt in my mind that these 9 life skills will help you live your life to the fullest. Enjoy! The PDF E-Book version is only $9.97 U.S.! *The timeless personal development classic! Free Shipping & Handling (to U.S & Canada only)! ***Please Note This Orange Button below is for the hard copy of the book. The buttons above are for the E-book! BONUS: If you buy the hard copy you will receive the e-book version and 'As A Man Thinketh' for free! I will send you the links soon after your purchase. Please be patient in case I don't get to it right away, however, you will get the links within 24 hours. ✔ To make use of the many helpful tips, examples and strategies. "I'm so delighted with your book... it's full of invaluable advice for enhancing knowledge and life situations."